The mouth is the gateway to your digestive tract, so it should be no surprise that your oral health can point to possible digestive problems. These are some of the most common. 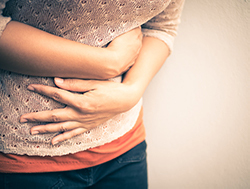 Inflammatory bowel diseases include Crohn's and ulcerative colitis. Some patients experience sores in the mouth, as well as inner cheeks and gum tissue that appear swollen. Certain medications used to treat the condition can also result in oral fungal infections like thrush. Your dentist may be able to identify symptoms of IBS when looking in your mouth, but if you already know you have the condition, you also want to make sure he is aware. Some patients use steroids for treatment, which could impact dental procedures. Since steroids impact the body's response to stress, complications like a quick decrease in blood pressure could result. Patients with jaundice, which is a condition that causes yellowed coloration due to an increase in bilirubin, may notice impacts with their oral health. Results may include a yellow tinge underneath the tongue and on the soft palate. Once the condition is treated, the coloring should return to normal. If you experience acid reflux or heartburn regularly, you might notice a burning sensation or bad taste in your mouth. This increase of acid in the oral cavity can have damaging effects on your teeth, specifically on the enamel. Likewise, frequent use of bismuth or antacids could cause a black, hairy tongue. Fortunately, your dentist may be able to prescribe specialized rinses or fluoride treatment to try and keep your teeth healthy. If you suffer from digestive issues, it is especially important that you visit your dentist regularly. Our dental team is standing by and ready to address your dental needs. Give us a call today to set up your appointment.